Oldham have signed Millwall striker Jason Price on a month's loan and re-signed Crystal Palace keeper Darryl Flahavan on loan until the summer. 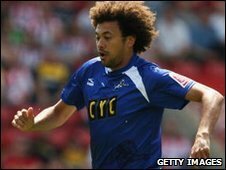 Price, 32, joined the Lions on a free transfer from Doncaster in the summer but has made just seven starts. Flahavan made eight appearances for Oldham during a loan spell earlier this season, before suffering an injury. Oldham have also extended the loan of Huddersfield midfielder Jim Goodwin until the end of the season. Price and Flahavan have joined the Latics in time to figure in Tuesday's local derby against Stockport County. And Oldham have revealed that both utility player Rob Purdie and midfielder Andy Holdsworth are set to miss the rest of the season. Purdie, 27, who is yet to kick a ball for the club since his summer move from Darlington, needs to have a hip operation, while Holdsworth, 26, is recovering from surgery to cure a long-standing knee problem. Meanwhile Millwall have extended the loan spell of Ipswich midfielder Liam Trotter until the end of the season and cancelled the contract of defender Marcus Bignot, 35, by mutual consent.